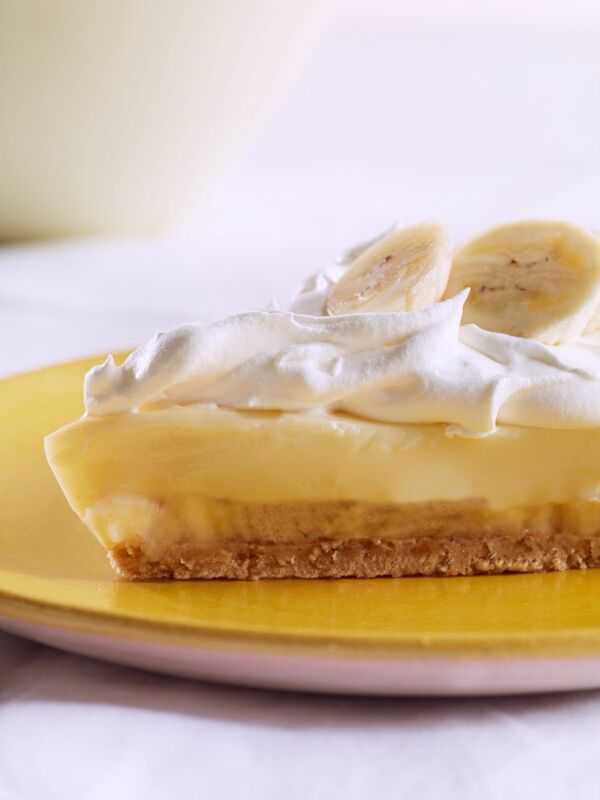 This banana pudding pie is a snap to whip up with a ready-made graham cracker crust, instant vanilla pudding, and fresh sliced bananas. Use frozen, thawed whipped topping or fresh sweetened whipped cream to top it off. Garnish the pie with toasted coconut or chocolate shavings and no one will know how "easy as pie" this was to put together. Make the instant vanilla pudding by combining the mix with the milk and following package directions. Spread the pudding in the crust and top with sliced bananas. Cover the pie and place it in the refrigerator to chill thoroughly. Once chilled, spread whipped topping or whipped cream over the top. Garnish with shaved chocolate or toasted coconut and serve cold or room temperature. The garnish on this banana pudding pie is what makes a very simple recipe look fancy and sophisticated. To create chocolate shavings, you need a bar of chocolate at room temperature and a vegetable peeler or fine grater. Simply run the vegetable peeler over the flat side of the chocolate. Alternatively, you can shave the chocolate bar using the smallest-holed side of a grater as you would if grating cheese. Whichever method you choose, make sure to place a piece of wax paper underneath. If you would like to sprinkle toasted coconut over the top of the pie, first spread about 1/3 cup of flaked coconut out in a single layer in a dry skillet. Place the skillet over medium-low heat and cook, stirring constantly, until the coconut is browned; watch carefully so it doesn't burn. Remove the coconut to a plate to cool before topping pie. If you don't finish the entire pie and want to save for down the road, you can freeze to eat later. Cover well with plastic wrap and then aluminum foil before placing in the freezer. Instead of vanilla pudding, use chocolate, cheesecake, or banana cream flavor. You can alter this recipe a bit by combining the pudding and whipped topping together before spreading into the graham cracker crust. This will give the pie a lighter, airier texture. Also feel free to add other fruit along with the bananas, such as raspberries, strawberries, or blueberries. Arrange a layer of banana slices on the bottom of the crust as well. Finish the pie with vanilla wafer crumbs.